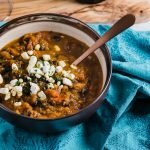 This vegetarian pumpkin chili is packed full of flavor from pumpkin, black beans, and adobo chilis. Top it off with goat cheese for a gourmet Fall dinner. And it cooks up in the slow cooker! Heat a drizzle of olive oil over medium heat, in a large pan. Add bell pepper and onion, and cook for 3-5 minutes until softened. In the slow cooker, combine the pumpkin, tomatoes, black beans, and chili in adobo sauce. Add the veggies to the slow cooker, and mix together. Add the smoked paprika, and a pinch of salt and pepper. Stir to combine. Serve topped with the crumbled goat cheese, if desired. Leave out the goat cheese for a totally vegan dinner!